The ASTER RT is a skillfully designed “Recessed Tank” (RT) style compact mod that is able to hold and hide tanks up to 22mm diameter. It is pre-installed with the new firmware that has preheat function and custom logo as well as different interfaces for you to check your total puffs and total vaping seconds. Also the firmware is upgradeable to be always the latest. The MELO RT 22 features its innovative “Retractable Top” (RT) solution which makes e-liquid refilling the easiest and most convenient ever. With a diameter of 22mm, the tank pairs perfectly with the ASTER RT. 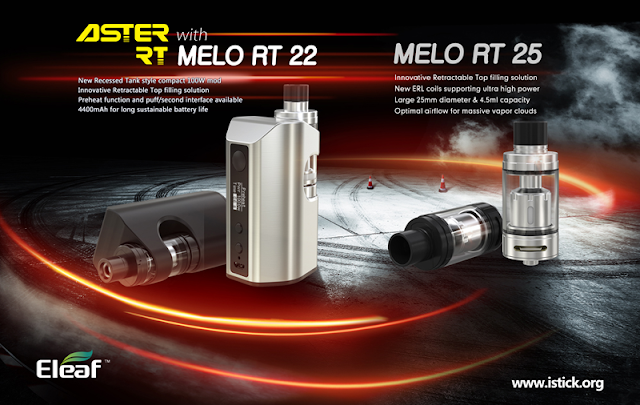 also you can know more informations about MELO RT 25 at http://www.istick.org.